It’s really amazing how long it takes to do things sometimes. I honestly hoped I’d be where I am now almost a year ago, but hey, life gets in the way, right? At least I’m finally making progress on the mainline. As of 1900h tonight, the first train reached Gilahina – or at least where the new Gilahina bridge will be in the future. Sure, the electrical isn’t complete that far out (power was provided by clip leads) and there really wasn’t any complex trackwork in that stretch, but I’m still happy that I’ve finally got mainline down and can run trains more than over a few switches. 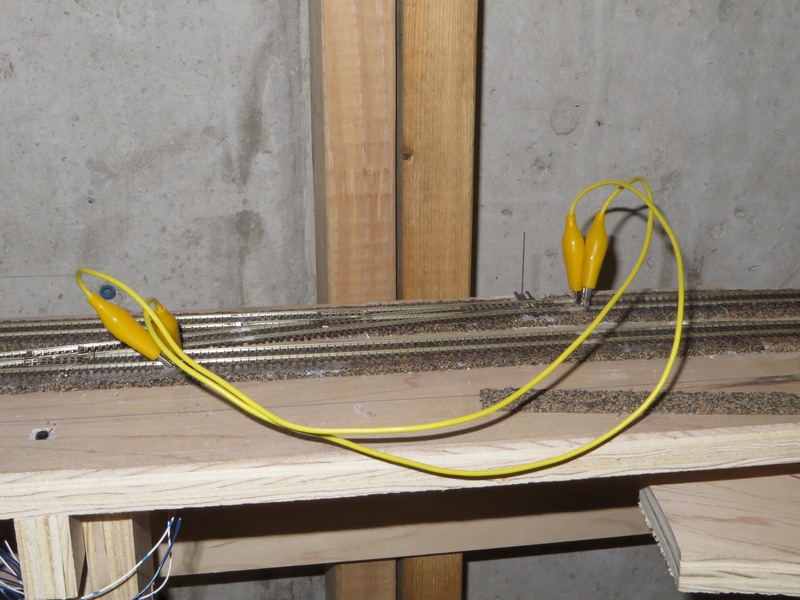 This entry was posted in Benchwork, Trackwork on February 16, 2015 by ndholmes. Unfortunately I had a fair number of other things to do this weekend, so I didn’t get as much done as I really would have liked. 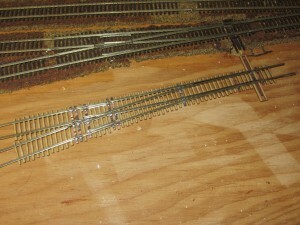 Typically for attaching N scale roadbed and track, I use DAP’s Weldwood contact adhesive. What can I say – it’s cheap and it works. However, the stuff is a witch’s brew of organic solvents that – in addition to potential biological side effects – features prominent warnings about causing an explosion when being used, say, ten feet from a furnace. During the summer that’s not an issue, since the furnace is shut down dead (and I have an electric water heater, so that’s not a concern). 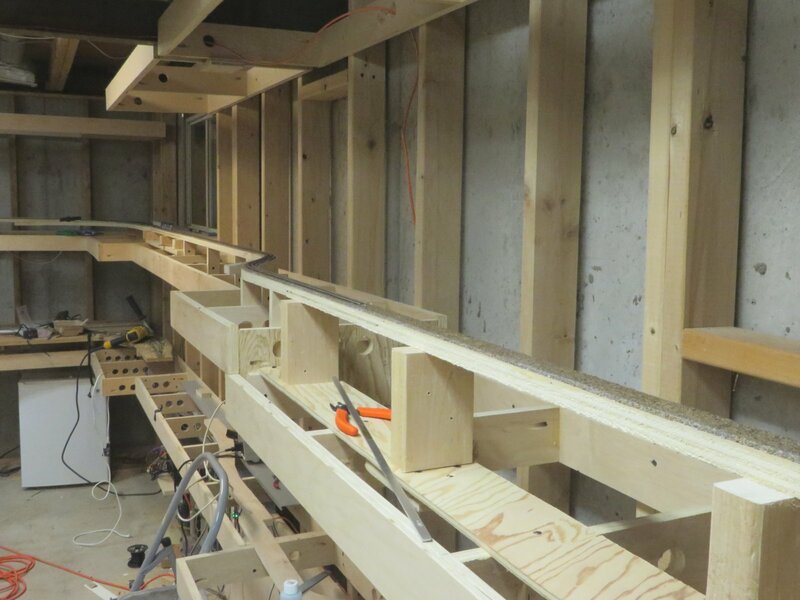 Since it’s now winter, ventilating the basement adequately to avoid the “big boom” isn’t as much an option. So I set out in search of a better adhesive that would be less likely to form a mushroom cloud in eastern Colorado Springs. What I found was 3M’s Fastbond 30NF. It’s still a polychloroprene contact cement, but the chemical engineering wizards at 3M have figured out how to make it primarily water-based, rather than all the organic solvents in most other contact cement. It’s explicitly marketed for its nonflammability when wet. In fact, the datasheet shows that it has no flash point – you literally can’t ignite it. Sure, it’s also rather expensive ($100/gallon), but less so than blowing up your house. The good news is that it works, and works very well in terms of bond strength. The bad news is that “Fastbond” doesn’t live up to the fast part of its name. It has a significantly longer wet stage than the organic solvent-based stuff, which is understandable even in such a dry environment as a Colorado winter. I found that I usually had to wait about 20-30 minutes between application and actually being able to adhere pieces together. The good news is that my concerns about it not bonding strongly enough (because, somehow, I assume anything not based on hideously harmful and/or flammable chemicals is inferior) were completely baseless. 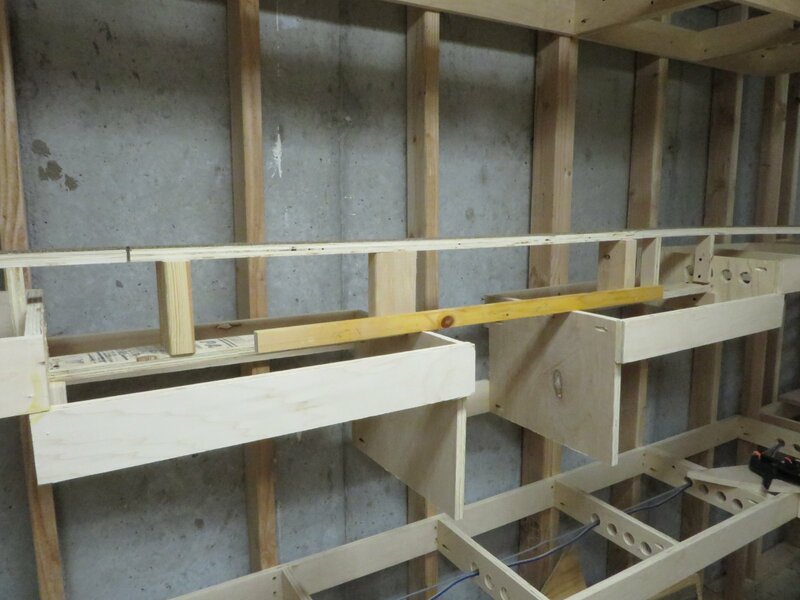 The 30NF bond strength seems significantly stronger than the Weldwood, up and to the point that I had to put spacers down to keep the track from accidentally sticking when I was assembling the rail joiners. At least twice I had a tie stick down so hard it detached from the rail when trying to get it up. As long as it endures over time (and I have no reason to think it won’t), this stuff is superior from a bond aspect. The other downside, besides working time, is that any frothy or clumpy spot will dry white. However, most of that will be under ballast, and you just have to be more careful to only apply a thin layer to the bottom of the track. Really it’s just about learning to apply more carefully than the “slather it on” method used in the past. 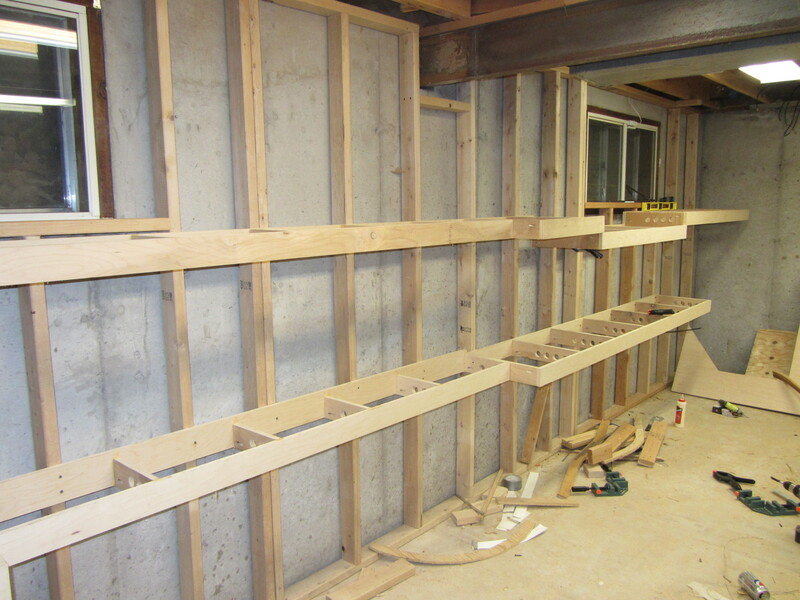 This entry was posted in Benchwork, Trackwork on November 24, 2014 by ndholmes. In 1915, the Alaskan Engineering Commission presented a report to then president Woodrow Wilson concerning the potential expansion of railroads within the Territory of Alaska. If you want to read the report yourself, Google Books has it scanned and online. Part of this was an exploration of potentially expansions to the Copper River & Northwestern, none of which were ever actually built. The report proposes two branches from near McCarthy to other nearby mining districts. One, a 14 mile branch, would extend around to the east side of Bonanza Ridge (the main Kennecott Mine was on the west side) up McCarthy Creek to the Mother Lode mine. The other, a ~17 mile line, was proposed from McCarthy further southeast to the gold mining district along the Nizina River. Because the Mother Lode Mine was on the opposite side of the ridge from the rest of the mines, eventually the tunnels were interconnected. Mother Lode ore was sent through the Bonanza Mine to get it to the other side of the mountain, and then down the trams to Kennecott to be loaded. There wouldn’t have been a reason to extend the railway around the backside of the ridge for it. More interesting would be the Green Butte and Nicolai mines, which existed on the east side of McCarthy Creek, might have been able to use rail service. The Nizina Branch idea is more intriguing, however. Even while there was active mining at Kennicott, there was placer gold mining going on at Dan Creek, southeast of McCarthy and on the opposite side of the Nizina River. Additionally, copper prospects had been described just a few more miles up the Nizina and Chitistone Rivers, along Glacier Creek. So it’s slightly plausible that – should copper mining have survived in the district – that additional mines would have been developed on these prospects. I don’t proclaim to be any sort of expert (or even novice of any note) in this area, but the US Geological Survey has a 1943/44 report on mining prospects in the Nizina District available as a PDF. The short version is that I needed more traffic at the north end of the line to keep operations on the layout interesting. 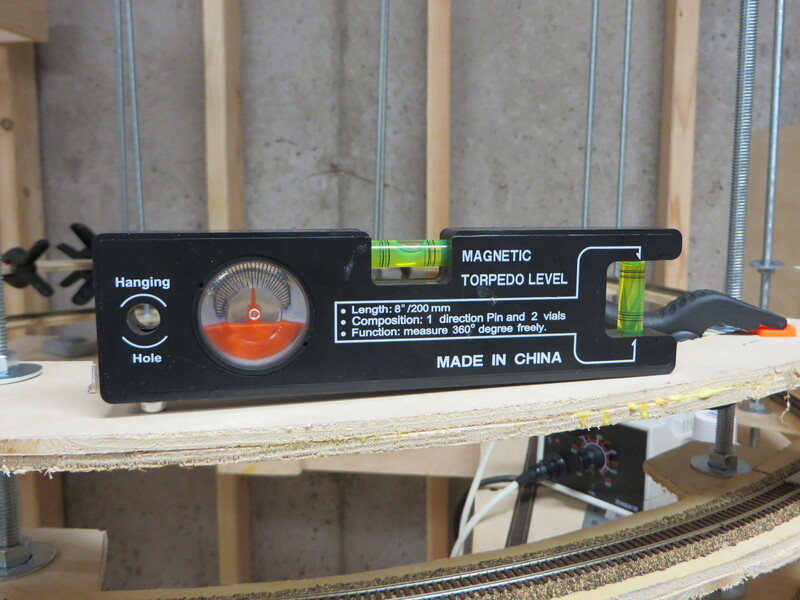 I also wanted a test track above my workbench that I could use for working on equipment and programming DCC decoders. 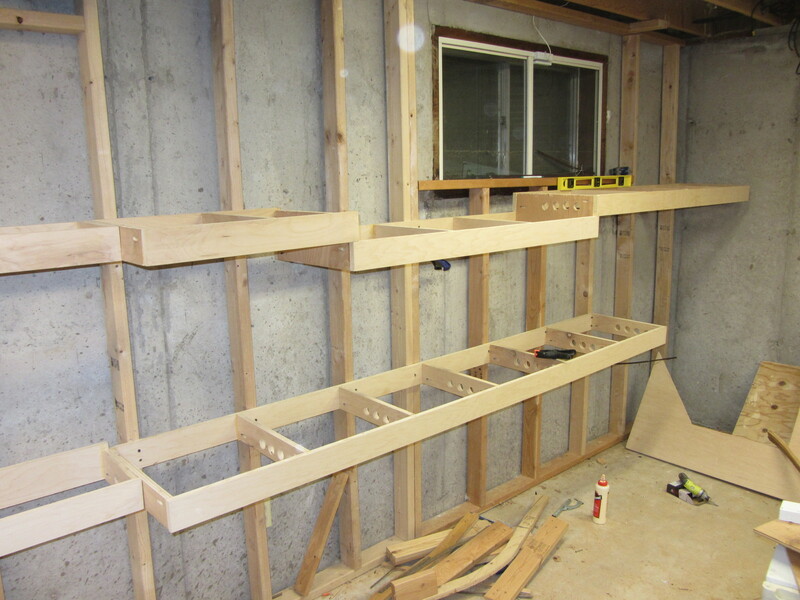 Given that the workbench is just across the wall from McCarthy and Cordova, and that McCarthy was at just about the right height for a workbench branch, I decided the “Nizina Branch” would be born. It will serve as staging for one empty coming up and one load going down each operating session. 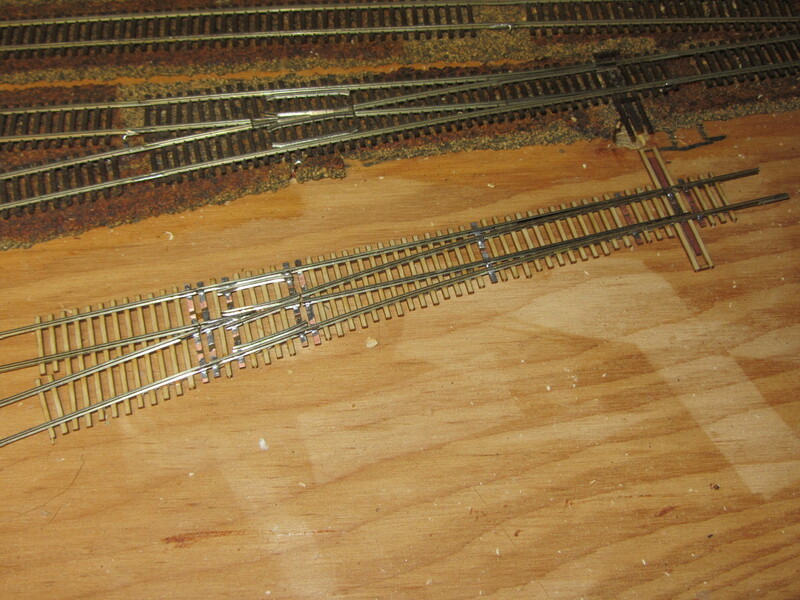 The yard is three tracks wide, with the one nearest the edge being the DCC programming track in addition to storage. Given that this is all just staging trackage, I used some leftover Atlas code 55 flex and turnouts that I had lying around. 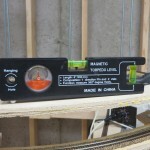 You may notice an odd bit of 3-rail track near the end, as if I’d decided to model dual gauge. Since I do spend a decent amount of time working on HO models for other folks, I needed the programming track to be compatible with both HO and N scale equipment. 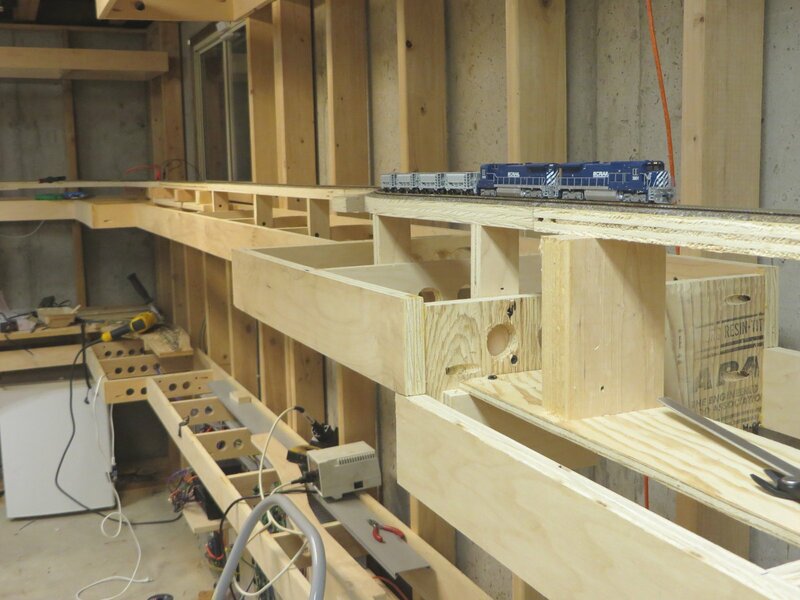 So, using a few PC board ties and some extra rail, I built a dual HO/N scale programming section. And yes, that’s a BC Rail B39-8 running around. It won’t be part of the CRNW’s roster, but much like my IAIS ES44ACs, I’m rather fond of it and you’ll probably see it running around in “unofficial” layout photos. The switch machines are, of course, my MRServo design. 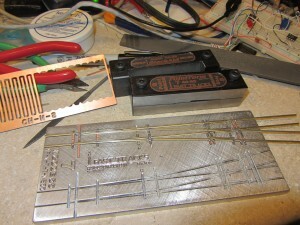 They’re completely open source, but available from Iowa Scaled Engineering if you want to buy some. 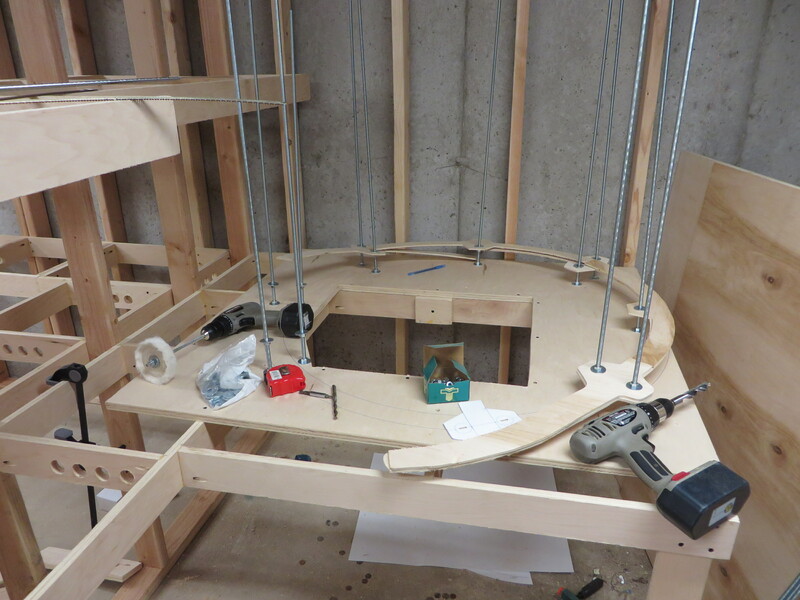 The wiring is still a bit rough – I haven’t gotten it all finalized yet. I was just happy to get the track power and programming track lines run back to the electrical panel with my limited time this week. 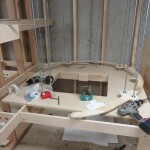 This entry was posted in Alternate History, Benchwork, Trackwork on October 30, 2014 by ndholmes. 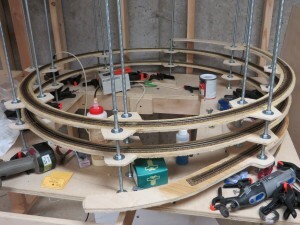 In between other projects tonight, I added another half-turn to the helix. Figured I might as well enjoy it a bit as well, so ran a quick test train – just one of the SD60Ms (future CRNW 600), a half-dozen ore jennies, and a boxcar that was sitting on my bench anyway. Figured out that an Atlas SD60M is good for about 20 cars on the 2.5% grade, based on a test I didn’t video. 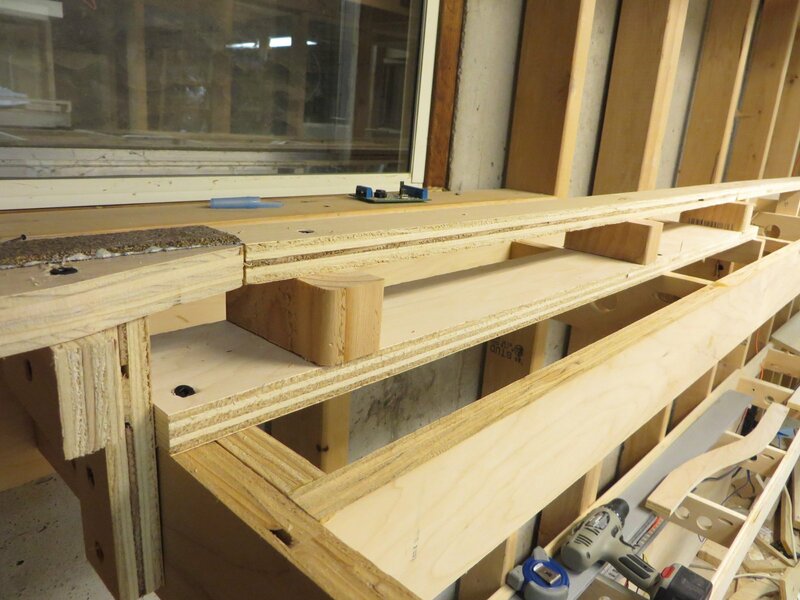 This entry was posted in Benchwork, Trackwork on September 11, 2014 by ndholmes. Between Abercrombie Canyon and Chitina lies nearly 70 miles of some of the most remote, inaccessible railroad in North America. Twisting and turning along the west bank of the Copper River, these miles would offer a great deal of scenic value, but little operational potential. There was no industry through this stretch, and damned few people at all. Those that were there consisted largely of native people, fishermen (largely in the lower canyon – there was once a salmon cannery around Abercrombie at MP 55), railroad workers, and of course the random outdoorsman. From a modeling perspective, it would be miles and miles of track on a narrow shelf, perched between the mountainside and the swirling blue-grey waters of the Copper. So, as I needed somewhere to shift between decks, I chose these remote 70 miles to compress into the great helix. 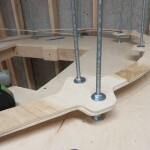 The structure will be a 20 inch radius, 8 turn helix connecting the lower deck at 35 inches above the floor with the upper level at 60 inches. This comes out to a grade of just under 2.5%. 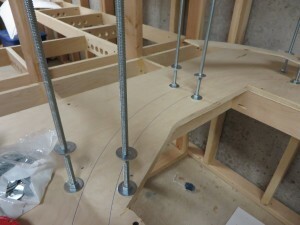 Inspired by other designs I’ve seen lately, I chose to use threaded rod as the main vertical supports. 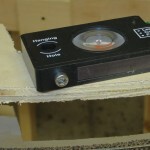 It’s simple to install, requires no precision cutting on my part, and allows for adjustment after installation. The basic design would consist of 8 sets of rods, each set 45 degrees apart and spaced by about 3 inches. These would be mounted into a lower plywood platform and extend upward through each helix level. Thanks in part to the explosion of 3D printers on the market (which often use threaded rod for linear drives), 3/16-16 threaded rod is abundant and cheap. I picked up 16 rods, each 36″ long, from eBay for something like $40 shipped. Nuts (part 90473A031) and washers (part 90108A032) were ordered from McMaster-Carr. 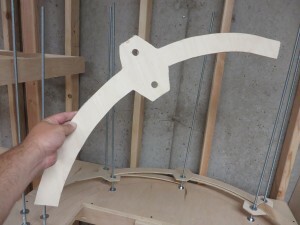 The roadbed itself would consist of 90 degree segments (quarter turn) cut from 1/4″ plywood, with ears at the halfway point for connecting with the rods. Two layers of these segments would be installed for the track bed, 45 degrees offset from each other. 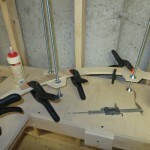 The segments are glued together using standard wood glue and clamped while they dry. 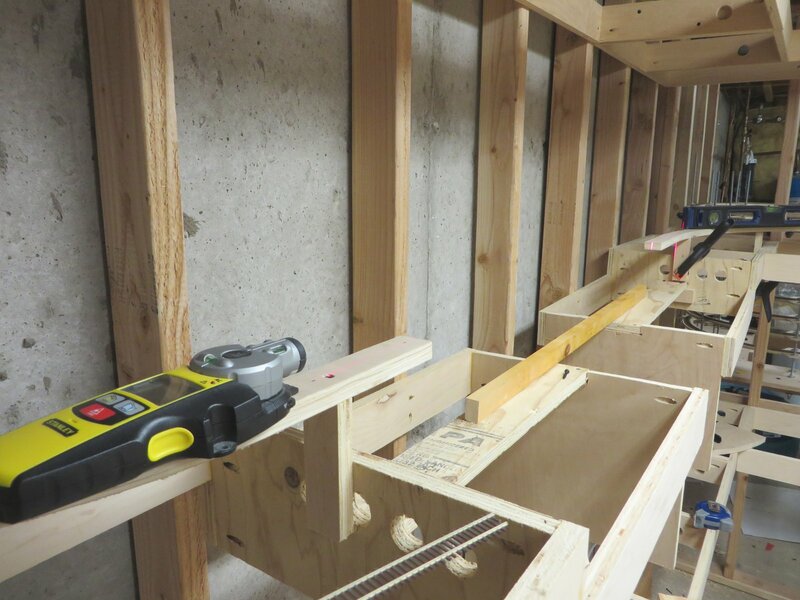 For the threaded rods, 5/8″ holes were drilled (very oversize for the 3/16″ rod) so that there was plenty of adjustment room. I specifically chose large flat washers so that I could have large holes for fine-tuning the alignment. Even though only the upper or lower roadbed segment is attached at each set of rods, this still provides a very strong roadbed once the glue sets and it’s bolted down. 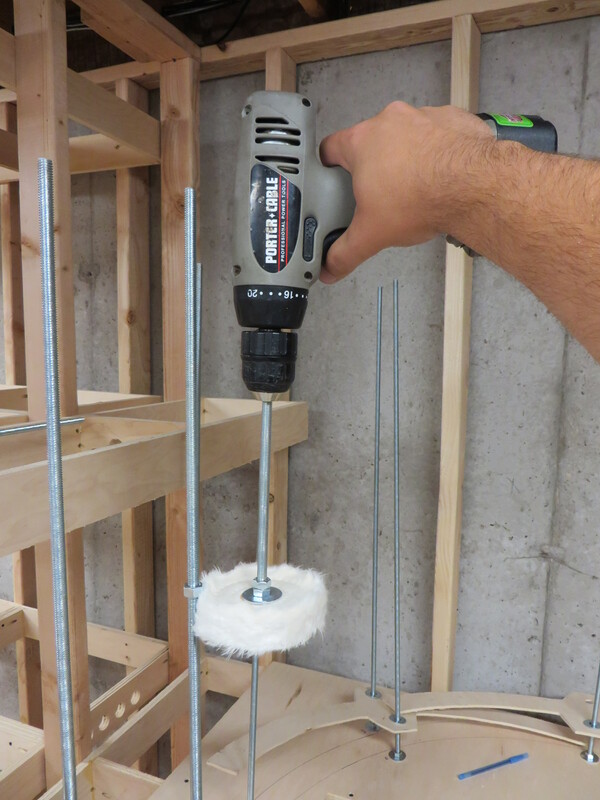 Here’s a handy tip – turns out spinning a few hundred nuts down a few feet of threaded rod is absolutely no fun. In fact, it’s downright maddeningly slow. Fortunately, there’s a better, faster way to do it. Just get a 4″ buffing wheel (meant for a bench grinder, maybe $5 at a home improvement store) and a short piece of threaded rod. Put a big washer on each side and a couple nuts, pop that sucker in a drill, and you have a nut turner. Makes very short work of spinning each nut down the rod. About the only gotcha is the occasional string that gets loose from the buffing wheel and jams the nut, but that’s easily cleared with just your hand. After that, it’s all just one step at a time. Add a couple segments, then go back and lay track before you cover up a helix turn with the next one. 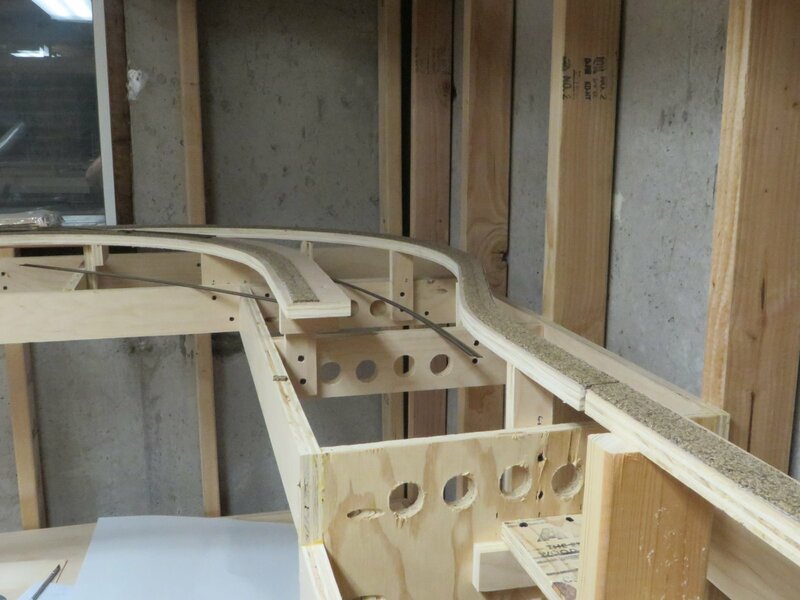 I typically have been keeping the track about 1/2 turn behind the benchwork, so that I can alternate between setting benchwork segments and laying track. To keep the grade constant, I built this handy grade measuring device out of a $3 Harbor Freight level. Over a span of 8″, a 2.5% grade will rise 0.2″. So, I had some hex cap screws lying around that had heads 0.2″ high. 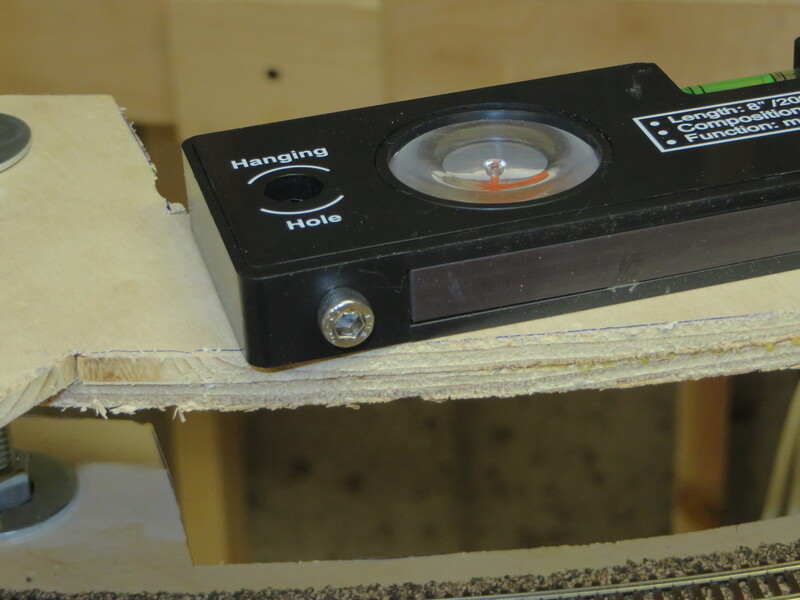 I drilled a hole in one end of the level and threaded in a cap screw. Ta da! Almost a perfect 2.5% grade level. 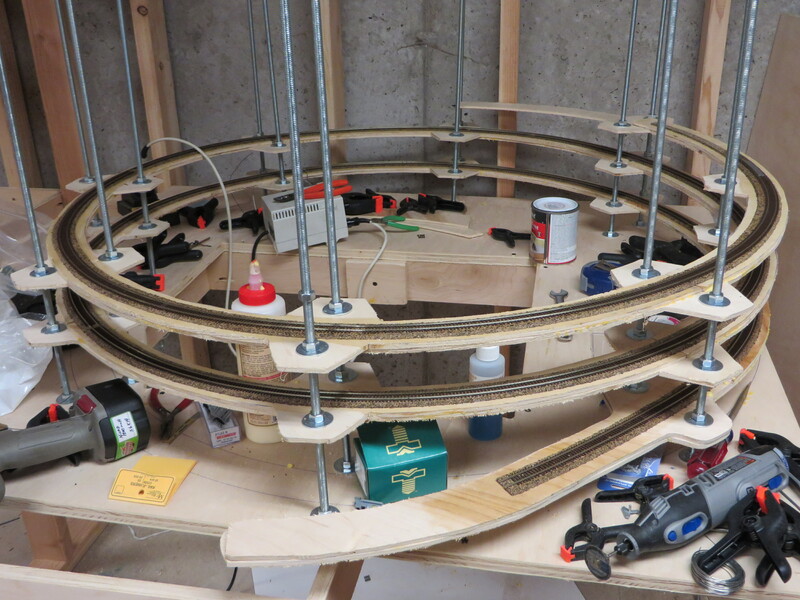 I just place it halfway between each set of rods, progressively working up the helix as I build the roadbed. I keep checking that the distance from one level to the next is a consistent 3-1/8″, but so far I haven’t had any issues using just the level method. 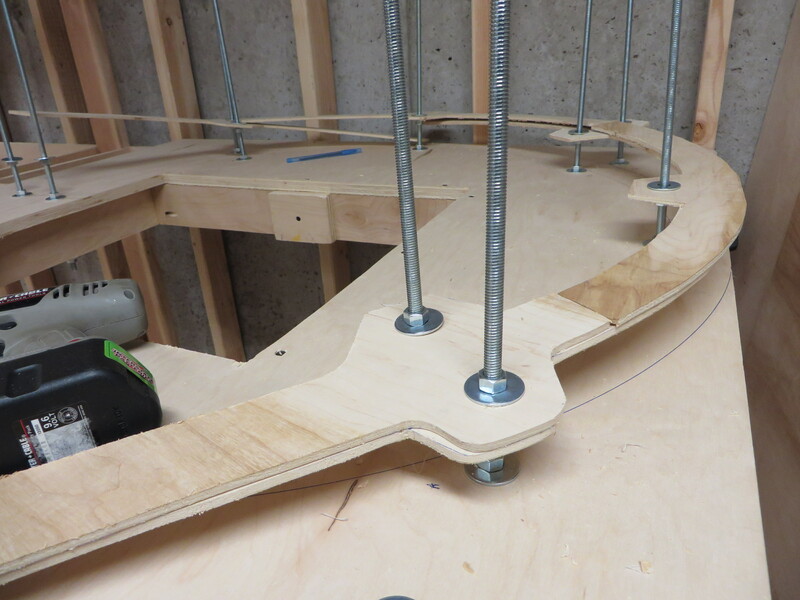 Once each piece is determined to be the right grade, I firmly set the nuts against the washers and the roadbed. As of when I called a night tonight, this was the status of the helix – about halfway through the third turn. The roadbed and track are both held on with my usual method of DAP Weldwood contact cement. I’m out of plywood segments that have been cut, so I’m calling it a night at this point. I’m taking Labor Day off to take in a baseball game (and then some – the Rockies still have three make-up innings against the Giants from a rained-out game last May, so tomorrow will be at least twelve innings). Regardless, it’ll be a break from the basement. 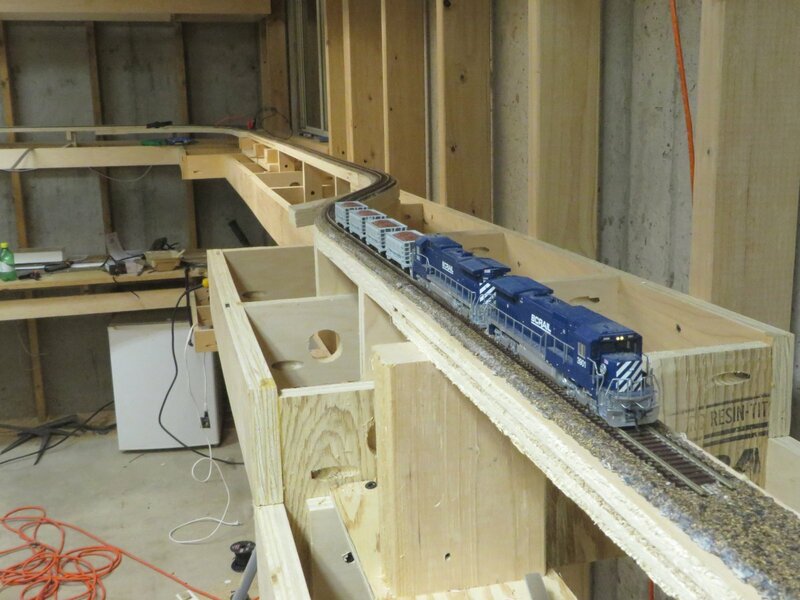 I do plan to do some pull tests using a couple SD60Ms and ore cars to make sure we’re in the ballpark – no pun intended – of having the right grade for the trains I plan to run. This entry was posted in Benchwork, Trackwork on August 31, 2014 by ndholmes.